This is a sample of a Wedding Invitation set which includes; save the date card, RSVP card, directions, place cards and two samples of thank you cards. All envelopes are lined and have the return address printed on, excluding the large invitation envelope, which comes with a return address seal. 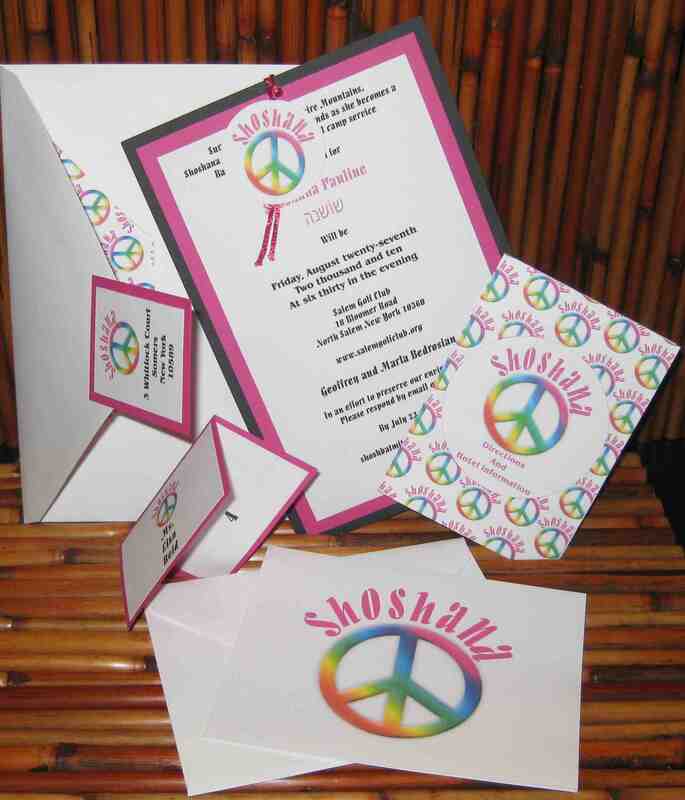 This is a Bat Mitzvah Invitation set which includes; the invitation, directions, place cards, and tent fold thank you cards. In this particular invitation, the client chose to have RSVP's done via email. The invitation envelope is lined with a custome made liner and comes with a return address seal. 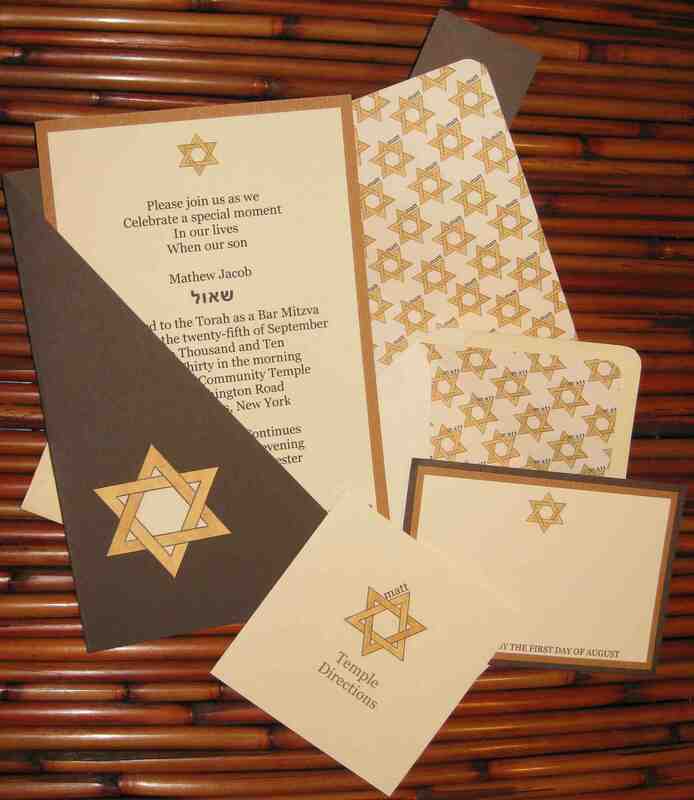 This is a Bar Mitzvah Invitation set which includes; the invitation, directions and RSVP card. The envelopes are lined with custome made liners and the large envelpe comes with a return adress seal. This wedding invitation comes in the form of a scroll. It includes a cord with tassels to tie it all together and is mailed in a white mailing tube. In order to help preserve the environment, a website is provided for details and to RSVP. A Black and White 21st Birthday Invitation. It features a corsett made out of plastic paper on the front. It comes with a RSVP card, direction card and lined envelopes. This is a 7 x 7 inch Wedding invitation and features a cinnamon stick which is tied to the front with a tasseled ribbon. It is in a book like form of which the covers are covered with a delicate purple decorative paper. The invitation Text is layered on top of a purple card stock. The inserts are held in place by a little pocket inside made of the same delicate purple decorative paper. A Sweet Sixteen Invitation with a sweet touch. The invitation is attached to a chocolate bar and comes in a sweet little pillow box made out of delicate decorative paper, which is also found on the back of the RSVP cards, Direction Cards and the invitation itself. The invitation containing the chocolate is best delivered by hand, especially during the warmer months, but a non chocolate invitation is also available for mail delivery. Here you have an informal yet delicate wedding invitation in the form of a fan. It features a flower and colorful ribbon. A 100% recycled paper box holds the fan which is tied with ribbon and mailed in a white bubble enverlope. The back of each blade is covered in a decorative paper and embossed with a pretty patern. This is a layered black and blue Bar Mitzvah Invitation set. It includes the RSVP card, Directions, Return Address Seal, Place Cards, Thank You cards and printed and lined Envelopes. This Bat Mitzvah Invitation is modern looking in its triangle shape. It includes a RSVP card, directions, return address seal, belly band and place card, all in a triangle shape. The invitation, place card and belly band features a green gem. The envelopes are lined and features the design used all through the invitation. The back of the invitation and RSVP cards are covered in a suede paper which is used to also keep the inserts together. Someting different, a round Bat Mitzvah invitation featuring a crisp decorative paper as backing. It includes a RSVP card and a double sided direction card. All envelopes are lined and features the design. A winter celebration, this Bat Mitzvah invitions comes in a small white jewerly box and features a bright colored ribbon. The text is printed on a white vellum paper covered in snowflakes. The set inclueds a RSVP card, Direction card and Hotel information card. The place cards and menus are also printed on snowflake vellum paper and features a ribbon. This wedding invitation is made out of card stock covered with a stitched decorative paper and features a delicate brown ribbon. The inserts are placed in an embossed pocket inside one of the flaps. The invitation is layered ontop of brown card stock to give it a border. Included is the RSVP card which is also lined in the stitched decorative paper and a double sided directions card, all held together with the delicate brown ribbon. The place card also features the decorative paper. All envelopes are printed and lined. A special invitation for a special day. This invitation features a paper Lantern with the event name and date dangling inside. It is a hand made lantern made of cardstock covered in embossed decorative paper. The invitation itself is layered on a gold paper to give it a border, as is the RSVP card and place card. Included is a double sided direction and hotel information card. 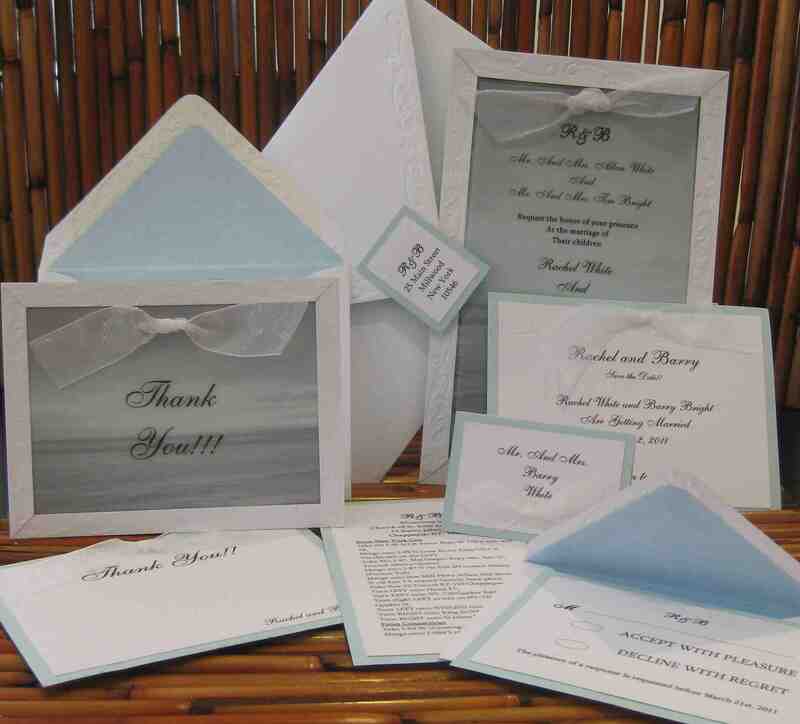 Inserts are held together with a textured ribbon and the whole invitation set comes in a little window box. Whether the theme of the special event is sports, arts, theater or candy, the invitation can be customized. Here is a Bar Mitzvah invitation with a sports theme. The text is printed on red paper and layered on black cardstock to give it a border. The whole packet comes in a slivery black pocket which fits in a large, lined and printed envelope. It includes the RSVP card, Directions and Hotel information card. Whether you are having a Holiday party or just want to send out Happy Holiday wishes to family and friends, this style card will do the trick. It is Printed on glossy photo paper and is lined with a suede paper on the back to give it a soft feel. Your custom design can be printed on the suede as well. It comes with a printed and lined envelope. Please visit again for more Invitation samples!